Come, celebrate Farmers Market Week at Muldoon Farmers Market, open 9 a.m.-2 p.m. Saturday, August 11, in Chanshtnu Muldoon Park, 1301 Muldoon Road (at DeBarr). Fresh produce and flowers from local farms and gardens, Alaska seafood, honey and eggs. 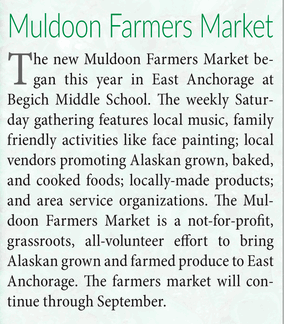 Locally cooked and baked food, Alaska arts and crafts, live music. Family friendly. Accessible playground. This entry was posted in event and tagged 2018, August. Bookmark the permalink.